Park Ave BBQ has been a part of my lunch and dinner rotation at home and the office for years (NPB and PB Lakes locations). It’s casual, with legit portions and a good value. The decor is goofy, for lack of a better term, with decorations ranging from bedazzled”Eat Hearty” signs (Ed Hardy-style) to camo S.P.O.T. gear, peace sign hand gesture statues and glass bottle chandeliers. It’s all in good fun and they actually have a pretty substantial store of t-shirts and whatnot for PA BBQ lovers now. It’s a locals’ spot and is named after the road it started on in Lake Park, FL. 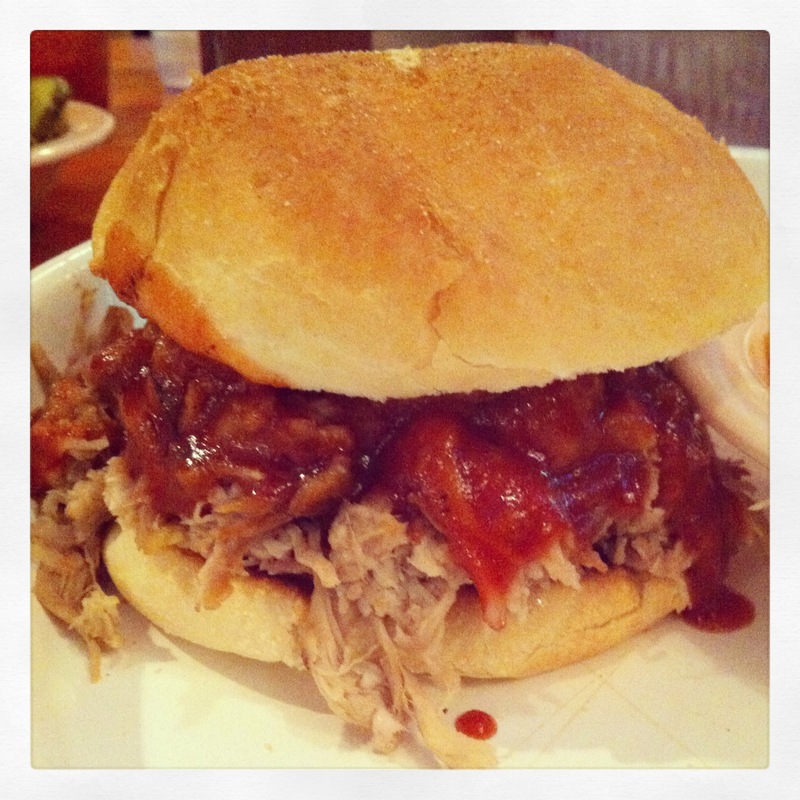 One of the reasons this place is on my list of “usuals” is because I like a variety of things on the menu: the Cheeseburger, Pulled Pork Sandwich, BBQ Chicken Sandwich, Baby Back Ribs (all you can eat special on Tuesdays! ), Texas Toast BLT, Pulled Chicken Sandwich… even the Lance a Lotta Chicken Soup! They offer an array of sides, my favorites being the Mac & Cheese, Fries, Baked Beans and Collared Greens. They also bring you these sweet and spicy pickles when you sit down called “Hotties” which are awesome – though I don’t recommend taking a bite until you’ve gotten your drink. Their Corn Fritters are awesome, but with the portion sizes I feel like those rarely happen for me. When they do, I use both the honey and syrup and say yes to powered sugar. Go big or go home. Sauce-wise, I go with the “Conservative” BBQ sauce which is the less spicy compared to its “Extremist” counterpart. It’s the one with Abe Lincoln on the bottle. Depending on the location, they have different size bars with an assortment of beers, including some locals which is nice. They offer catering and take-out too. Service is typically great and the people who work there always seem to have a good personality. Whoever does the hiring has a good eye. Vinegar-based BBQ sauces are more runny and soak in more. Tomato-based are thicker and sometimes coat rather than sink in to the meat.